Blue Apron CEO Brad Dickerson has left the company to pursue other opportunities. He will be replaced by Etsy COO Linda Findley Kozlowski. Blue Apron shares were up more than 15% following the announcement. Watch Blue Apron trade live. Blue Apron was soaring Tuesday evening, up more than 15% to $1.12 a share, after the company announced CEO Brad Dickerson has left the meal-kit maker to pursue new opportunities. He will be replaced by Linda Findley Kozlowski, who was most recently the COO at Etsy. “We are incredibly excited to have an executive of Linda’s caliber as Blue Apron’s next CEO,” said Matt Salzberg, chairman of Blue Apron’s board of directors. 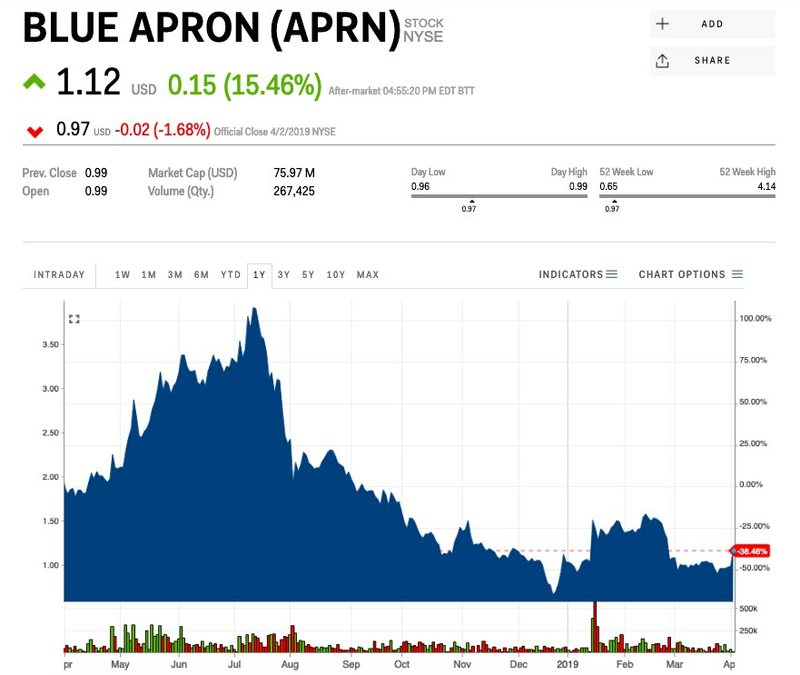 Blue Apron has had a difficult time as a publicly traded company since its June 2017 initial public offering. First, Amazon announced plans to buy Whole Foods, causing Blue Apron to slash its IPO range to between $10 and $11 a share, down from $15 to $17, as investors worried about the competition such a deal would bring. Then, less than a month later, Amazon rolled out its own meal-kit business. More recently, the meal-kit maker has had trouble holding onto customers. Last August, Blue Apron said its total number of customers plunged by 24% year-over-year in the second quarter and that revenue per customer was down by $1 to $250. At that time, the stock was trading near $2 a share. And in December, Blue Apron tumbled to a low of $0.65 before a partnership with Weight Watchers ignited a rally to more than $1.60. After giving up some of those gains, shares hovered near the $1 level for much of the last month before Tuesday evening’s news sent them to their best level since the end of February. Blue Apron was down 5.3% this year through Tuesday’s closing bell.